Digital photography is a natural progression in photography and it's instant and you can edit the pictures yourself on your computer. All of this is easy to learn and takes away the waiting for prints. Another huge attraction is that you can print pictures at home, instantly delete a bad picture, and also e-mail pictures to friends and family (and for business) much sooner after taking the pictures. In this book you'll learn about pixels, the different cameras to choose from, batteries, software, taking pictures, using a flash, file formats (JPEG, BMP, TIFF, GIF), downloading, editing, etc. You can manipulate the pictures yourself and crop or lighten or darken wherever you fancy. Greenberg covers a large amount of what to do with your pictures (on the computer) and how to improve them using the tools offered. It all sounds terribly difficult and complicated but if you are a little computer literate, you'll probably not have much trouble increasing your knowledge. Follow the instructions by "doing" what is said, and with a little practice, you'll get the hang of it. If you prefer to concentrate on just taking the pictures, the information in this book will still be very helpful to you. A good tip I picked up for when you're choosing a digital camera, is to look for details on shutter lag (the delay between when you press the button and when the camera actually takes the photo) as this can prevent you from capturing movement. Something I've learned is to do all the editing at once and file the picture only once - the more you go back to work on a picture and continually save it, the more the quality decreases. Here they suggest you save an original in a TIFF format and use this format for editing (if you have to go back more than once to edit) and then save the final image as a JPEG. Good advice. 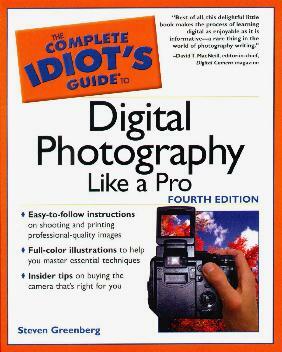 If you are into SLR cameras, see my review on The Pocket Idiot's Guide to Great Photography for helpful information.